I still remember when my mother used to make kala chana masala on Ashtami. She did not use onion and garlic as I have done since kala chana was for prasad along with puri. 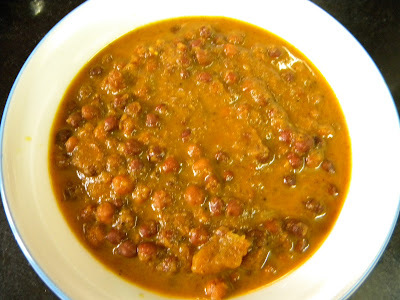 Kala channa curry or black chickpeas curry is a very nutritious and tasty dish. Kala chana is a rich source of protein and fiber. It's my favorite legume and I make it in curried or dry form that is sookhe kale chane whenever I get a chance. 1. 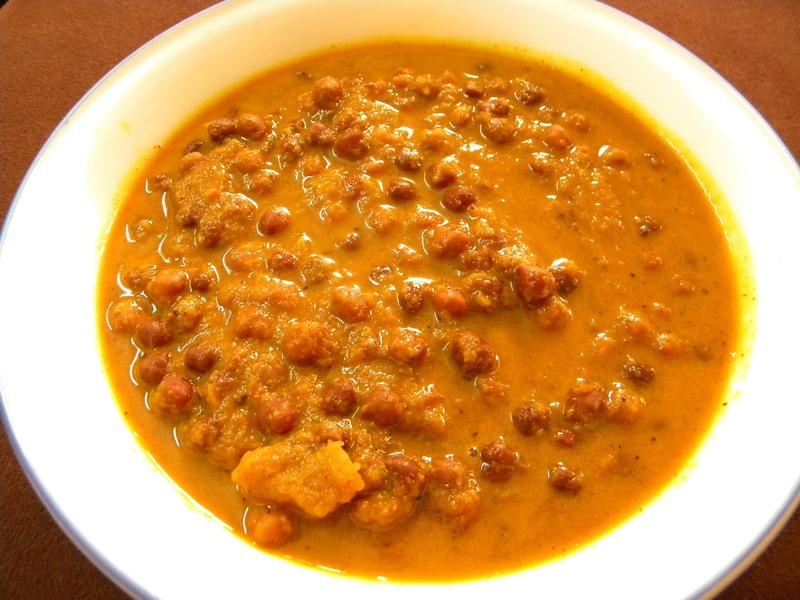 Place kala chana with enough water and salt in a pressure cooker and cook for 30 minutes or till chana is soft. Mash a handful of chana with your hands. 2. Grind together onion, ginger, garlic and green chillies to a paste. Puree the tomatoes. 3. Heat oil or ghee in a kadhai/ wok and add cumin seeds. When they turn darker in color, add hing. 4. Add onion paste and sauté till brown. 5. Add pureed tomatoes and all the spices. Fry till oil begins to separate from the masala. 6. Add kale chane along with the cooking liquid and mashed kala chana. Adjust the water level according to the consistency of the gravy that you want. Cook covered on a medium heat for 7-8 minutes. Serve kala chana curry with rice, roti or puri.